On this page I will have images and commentary of a socio-political nature. All opinions are my own and should NOT be construed as representing the views of anyone else! Low prices have a high cost. Will your grandchildren have a better life than your grandparents? Choosing evil is still choosing evil. It's like deciding between being shot or being stabbed by a mugger, either way, you are still harmed. As a Teddy Roosevelt style conservative, whose ideology is shaped by classical liberal thought, Anglo-Saxon Heathen common law and some bit of chaos theory, I have deep trouble finding anyone in either of the two "major" parties that is distinctly different in effect from each other. Take back America, vote the bums out. 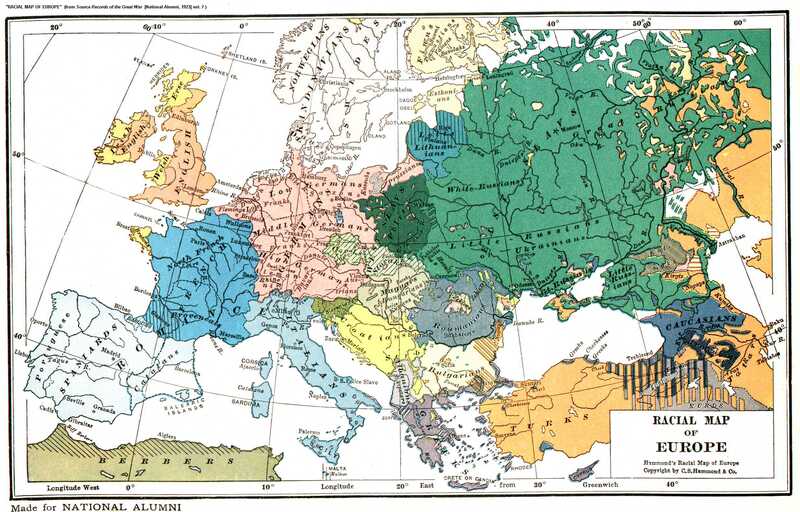 A pre-WW I map of the (as then defined) racial makeup of Europe. My ancestors were a mixed lot: from White Russian and Don Cossack in the East to Irish in the West - Italian in the South to Norwegian in the North - and German in the Center, and interconnecting points in between. I am all of them, but They were not me, nor anyone else now living. They have my love and my pride in Their parentage. Above found at "The Whitehouse: Officious Gift Shop" on Cafe Press. but they do deserve a plug for the graphic. Click here for a higher resolution view.